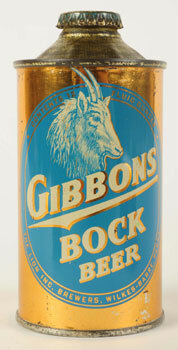 From the Adolph Grenke collection, an early 1940s Gibbons Bock Beer can, considered the nicer of two known examples. Morphy Auctions image. DENVER, Pa. – Dan Morphy, CEO of Morphy Auctions, has confirmed that the renowned Adolph Grenke breweriana collection will be auctioned in its entirety at Morphy’s gallery on Sept. 21-22, 2012. 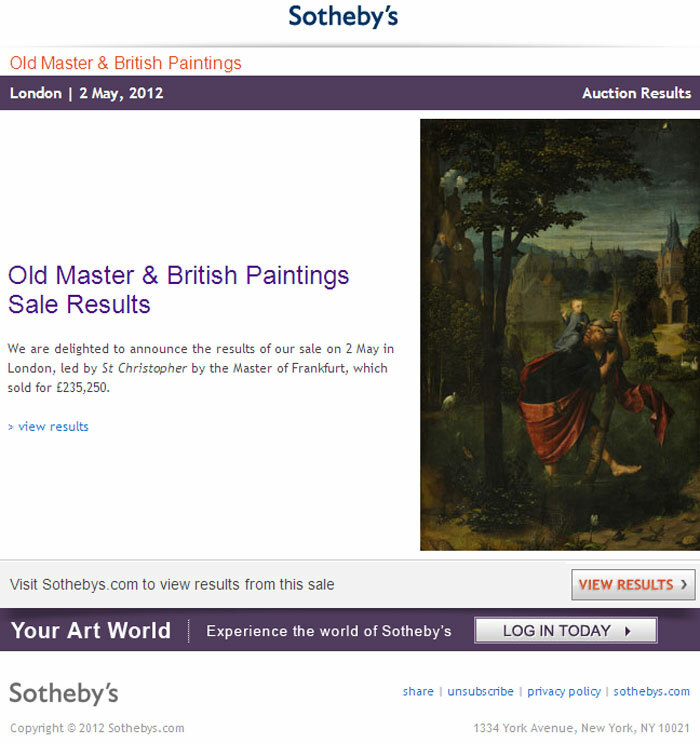 “No other consignments will be added. 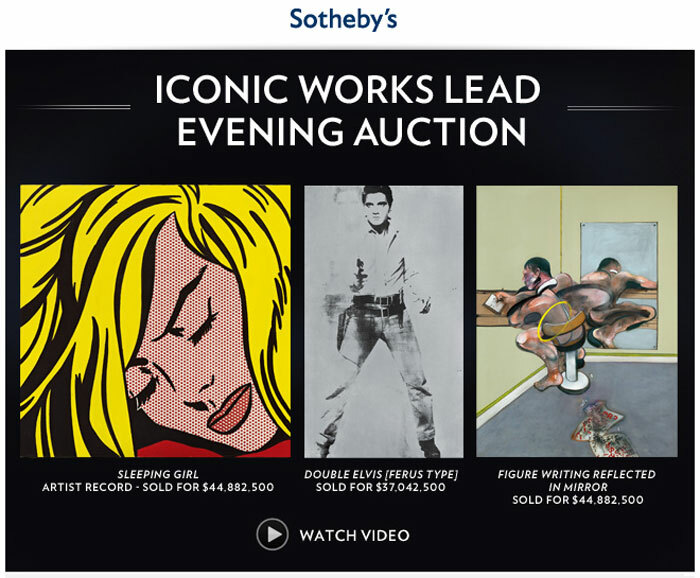 The entire two-day sale will be devoted exclusively to this outstanding single-owner collection, which we anticipate will bring well over a million dollars,” said Morphy. The collection also includes over 400 beer taps – with many expected to realize more than $1,000 each – and a bevy of colorful advertising signs. Highlights include over 50 Gillco glass light-up signs, and two examples of late-19th-century Anheuser-Busch signs of such rarity that they are not even represented in the famed St. Louis brewery’s archive. “What makes the Grenke collection so exciting as a whole is its condition. Mr. Grenke always adhered to very strict buying guidelines. He bought only items that were in near-mint-plus condition or better. Even when something extremely rare was offered to him, he would pass if it did not satisfy his standards for condition,” said Morphy. Because of the importance of the Grenke collection, Morphy has enlisted the services of two noted specialists to handle the grading and description of its contents. Dan Morean of Breweriana.com will catalog the beer cans, while dealer/collector Les Jones will be in charge of the breweriana and advertising section of the sale. Morphy Auctions will display highlights of the Adolph Grenke breweriana collection Aug. 1-4 at the 41st Annual National Assn. of Breweriana Advertising Convention, at the Springfield Hilton, Springfield, Ill.; and the Brewery Collectibles Club of America’s 42nd “CANvention,” Aug. 30-Sept. 1 at the Sheraton Springfield in Springfield, Mass. 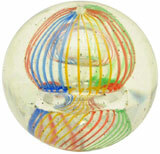 Further details about the auction, as well as catalog-ordering information, will be available soon on Morphy Auctions’ website, www.morphyauctions.com. 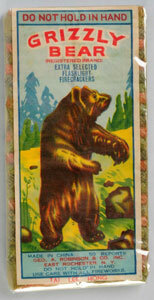 Grizzly Bear 50-pack firecrackers, manufactured by Tai Lee Hong. Mint condition. Est. $1,000-$1,500. 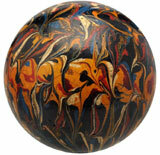 Morphy Auctions image. 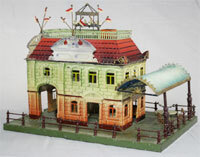 DENVER, Pa. – Fourth of July celebrations will begin early this year, with Morphy’s June 22-23 auction of the spectacular George Moyer collection of antique and vintage firecrackers. Known and revered by “pyromaniacs” throughout the United States and abroad, Moyer’s 40-year collection consists of thousands of rare firecracker packs and label, salutes, consumer novelties, sparklers, caps and smaller tubed items. Additionally, there are posters, catalogs and salesmen’s sample boards, which were created to display products available to retailers in days gone by. One such catalog was published in the 19th century by Rochester Firework Co. 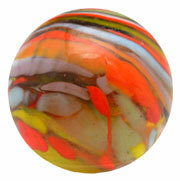 The entire, unpicked collection will be apportioned into more than 1,300 colorful lots, some containing multiple pieces. 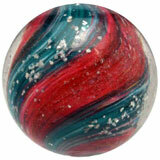 While the main focus of the collection is American-made fireworks, there are also items from England, India and Canada. Moyer, who is a native and lifelong resident of Pottsville, Pa., owns an amusement machine company. “I made my fun my work,” he said with a laugh. 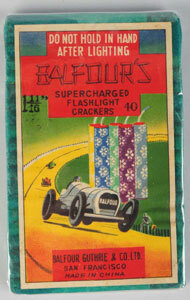 Balfour’s 40-pack firecrackers, manufactured by Balfour Guthrie & Co. Ltd., San Francisco. Mint condition. Est. $800-$1,200. 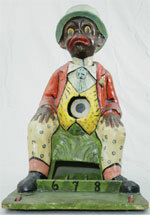 Morphy Auctions image. Moyer began collecting fireworks-related items at age 10. “I spotted a label on a pack where some boys were shooting off firecrackers. I picked it up and thought it was neat, so I started picking up more labels the same way, looking for them where kids were shooting them off,” he said. In the early 1970s when Moyer acquired his first pack, there were no organized groups of collectors or publications devoted to the hobby. Collectors found each other through ads or would run into each other at general antique shows or toy shows, he said. 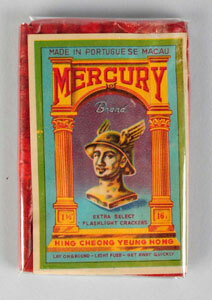 Mercury 16-pack firecrackers, manufactured by Hing Cheong Yeung Hong, Portuguese Macau. Near-mint condition. Est. $500-$1,000. Morphy Auctions image. Moyer’s interest in fireworks never waned. After completing high school and a stint in the military, he hooked up with a friend who had a professional fireworks company in New Jersey. Over the years, he has maintained his association with the company and is a licensed pyrotechnician who can legally set off fireworks at public events. “To this day, I still fire them off,” Moyer said. Some of the earliest items contained in the Moyer collection are Chinese black-powder (gunpowder) firecrackers from the early 1800s. They are identifiable from their distinctive red labels with gold print. Black-powder firecrackers were phased out when flash crackers – which “blew up better” – were introduced, Moyer said. The Moyer collection contains scores of rare labels that are sure to appeal to collectors. “I have many things in my collection that I believe most of my fellow collectors don’t even know exist,” said Moyer, who included selections from his personal stash in the beautiful full-color reference book he co-authored in 2000: Firecrackers – The Art & History. 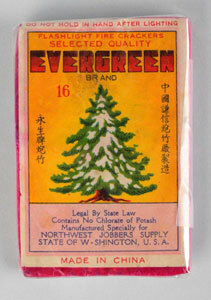 Evergreen 16-pack firecracker. Est. $500-$1,000. Morphy Auctions image. Among the rare packs and labels to be auctioned are titles including: Evergreen, Merry Go Round, Puppy, Ostrich, Gee Whiz, Marine Brand, Battleship, Fountain Brand and Tarzan. Especially appealing graphics are seen on Unexcelled Fireworks’ “Jester,” which depicts a court jester, “Round One,” whose label is illustrated with a gloved woman boxer seated in the corner of a boxing ring, and “Tally Ho,” a British production for the US market that shows a horse jumper with dog running alongside. Two Canadian highlights are “Ibex” (black powder), with the image of a mountain goat; and “Niagara,” which, as the name suggests, features an image of Niagara Falls. Two other packs that are worthy of note are “Red Fox” and “Squirrel,” both manufactured by Wilfong Fireworks. Wilfong was a Texas company that made headlines in the early 1950s when its plant exploded and emitted a mushroom cloud that some locals mistook for an atomic bomb attack by the Soviets. 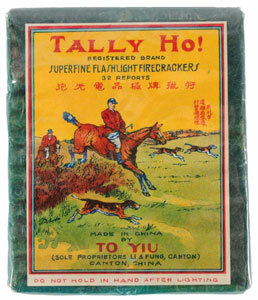 Tally Ho 32-pack firecrackers, manufactured by To Yiu. Est. $600-$800. 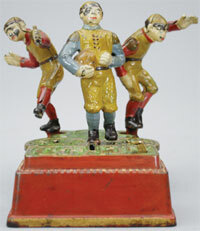 Morphy Auctions image. The collection includes three different types of Ft. McHenry salute boxes and a special display of firecrackers encased in glass so their distinctive wrapper designs are visible. A very rare and desirable box of Buck Rogers Disintegrators (salutes) is expected to attract crossover interest from space toy collectors. Its box cover is dominated by an illustration of the famous sci-fi hero brandishing a ray gun. Buck Rogers firecrackers, 1937. Est. $300-$600. Morphy Auctions image. Morphy Auctions CEO Dan Morphy said catalog pre-orders have been pouring in and that he expects a strong turnout of enthusiastic bidders for the June 22-23 auction. Both the June 22 and 23 auction sessions will commence at 10 a.m. Eastern Time. 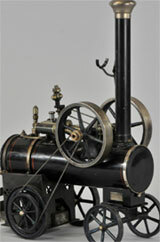 All forms of bidding will be available, including live via the Internet through Morphy Live or LiveAuctioneers.com. Note: Special conditions apply regarding the shipment of fireworks, which may not be sent through the US Postal Service. 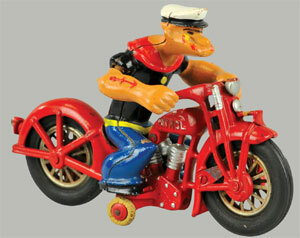 Further information about shipping of items in this sale will be posted soon on www.morphyauctions.com. 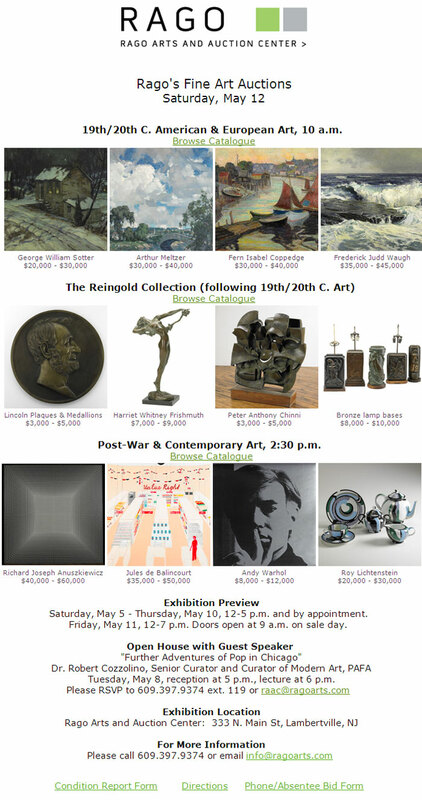 A printed catalog will be available the week of May 28, and a fully illustrated electronic catalog will appear online by May 18 at www.morphyauctions.com and www.liveauctioneers.com. 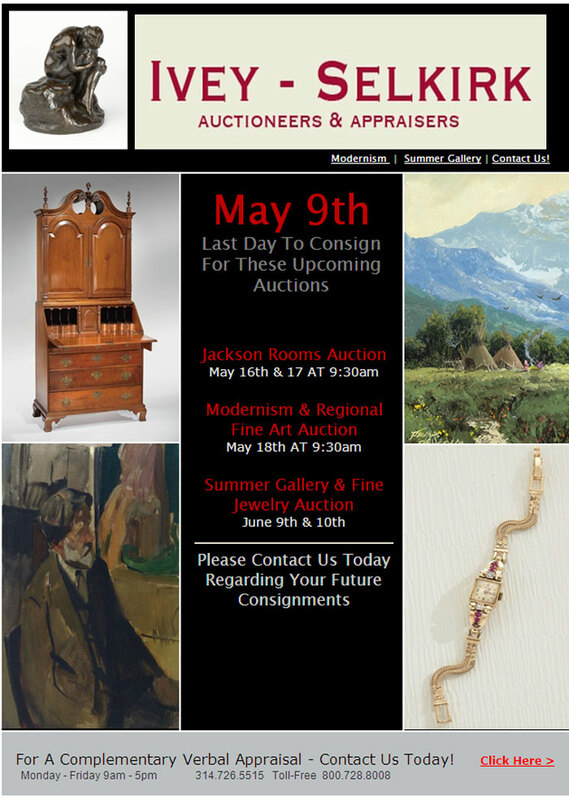 For additional information, call 717-335-3435 or e-mail serena@morphyauctions.com. 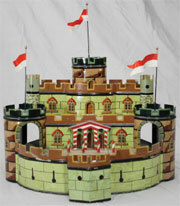 Visit Morphy Auctions online at www.morphyauctions.com. 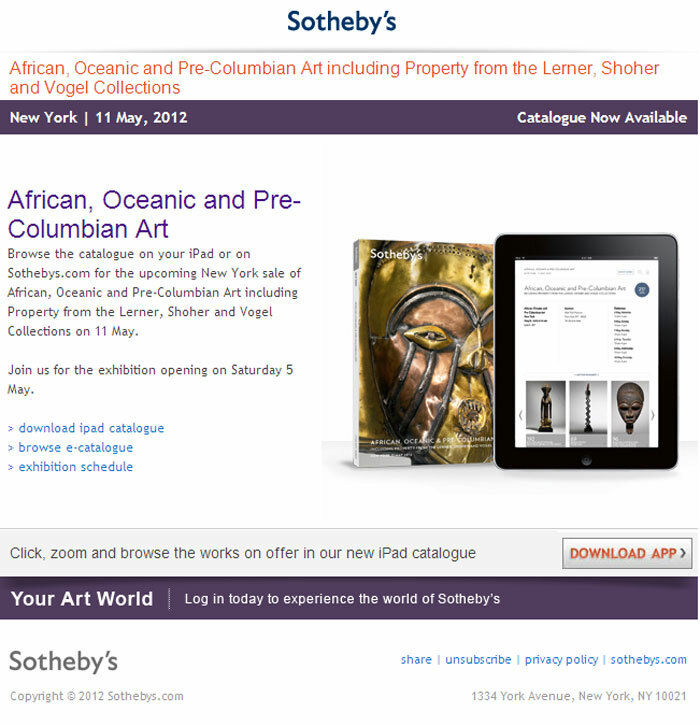 Sotheby’s will present a two-part sale of fine tribal art and artifacts on May 11, 2012. The African art collection of the late Dr. Werner Muensterberger will comprise a significant portion of the auction, showcased alongside a host of other exquisite lots from the Lerner, Shoher, and Vogel Collections.